Butter chicken or murgh makhani, is an Indian dish where chicken that is marinated in a yogurt based marinade filled with aromatic spices is served in a buttery and creamy tomato based sauce. The chicken is normally cooked in a tandoor but you can just as easily grill it or cook it up any way you like. As luck would have it, I already had a recipe for a tasty grilled tandoori chicken so I went with that. Up next is the tomato sauce which as the name suggests includes butter along with some cream that makes it a very rich and creamy sauce indeed. (To make things even creamier I also added some almond butter.) One of the primary and characteristic flavours of butter chicken is the fenugreek leaves or kasuri methi which I had never used before so I needed to track them down before hand. Although the list of ingredients for the tandoor chicken and the curry combined is quite large the recipe is actually pretty easy. Since the chick should marinate over night anyways you just need to worry about the butter chicken sauce which should leave you with some time to make some rice or even fresh naan to go with the meal. I served the butter chicken garnished with cilantro, toasted almond slices and a drizzle of yogurt, though a dab of melting butter is also really nice. Add the cinnamon, cloves, cumin and coriander and cook until fragrant, about a minute. Add the tomatoes, tomato paste and cayenne, reduce the heat to medium low and simmer until the sauce starts to thicken, about 10-15 minutes. Add the chicken, honey, fenugreek, almond butter and cream and simmer for another 10-15 minutes. Add the garam masala and salt and remove from heat. Serve over basmati rice garnished with butter and cilantro. Option: For One-Pan: Make this a one-pan meal by adding 1 cup of rice and 2 cups broth or water (or 8 ounces of pasta and 2 1/4 cups broth or water) to the sauce in step 5 and simmer, covered, until cooked, about 20 minutes (or 12 minutes for pasta). I've been begging my neighbor for her butter chicken recipe for so long. It's the only dish that keeps me from committing to being vegetarian! Thanks for the post! Yum, yum. Indian food is one of my all time favorite cuisines. This dish looks divine. 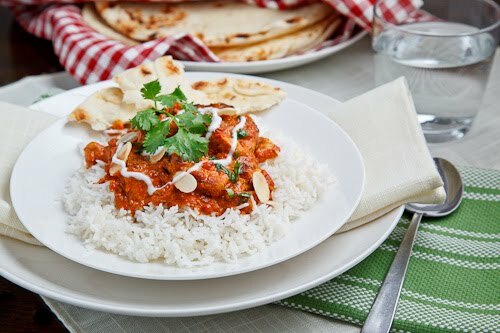 It looks similar to chicken tikki masala, which is one of the few Indian dishes my husband will eat. I will definitely have to try this soon. This looks delicious! I love Butter Chicken, sooo good. 🙂 All your recipes rock! Looks absolutely decadent, just like good butter chicken should be! Funny, it's not usually what I order, but there are some times when it's the only thing that will do to soothe the aches of a cold day. Mm… I've only had the Trader Joes version but this looks amaaazing! Great recipe! You did an awesome job on the traditional dish. Yum! Extremely mouthwatering! That spicy dish has everything to please me. relly nice and interesting recipe!! i have to tell you that your an amazing guy who has this awesome blog and i love reading your posts… though i have been following you a long time now… i thought i should leave a proper comment saying how appreciate i am!! by the way i had this dish in a restaurant before and it's amazing… bursting flavors!!! It looks deadly delicious! Indian Food! Looks so authentic! Am traveling to Punjab this weekend, and your post is making me dream of that lovely butter chicken already! Mmm I love finding new Indian recipes to dabble with and this one sounds delicious! 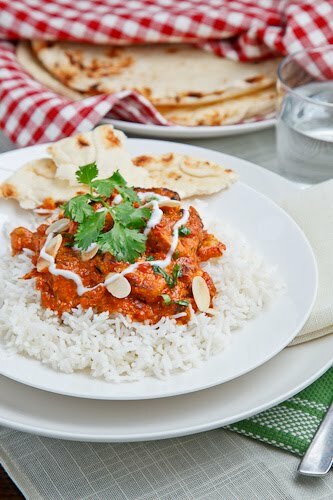 Butter chicken is my hands down favorite Indian dish…. I must make some soon now that I have this easy peasy recipe!!! Drooling over this dish Kevin. I'll have to try it. Love the pics. 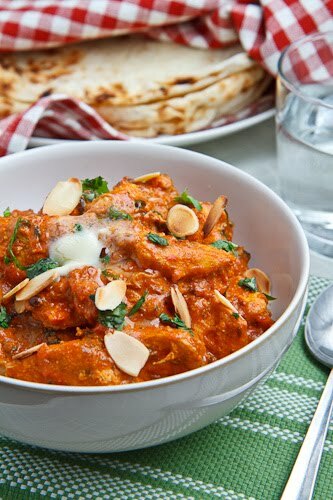 fantastic recipe – butter chicken just like a bought one! thanks, everyone loved it. I always look for new recipe's to cook online, for my husband and I. This was amazing. He is from West Africe so the typical American/Italian dish (that I thoroughly enjoy) usually doesn't do it for him. Chicken and rice is a staple for him, and this hit the spot. It was so good he was asking for more. Thanks. I'm passing this recipe along, too! Awesome looking Butter Chicken. Yum and delicious. I love your site!! This is the first recipe of yours that I tried out, and it was delicious and amazing, and surprisingly simple to make. Thank you! Amazingly DELISH dish Kevin, as ALL of yours ALWAYS are! I made this w/ Prawns (instead of chicken, just dropping them in at the very end before serving) last night for hubby and he said it was one of my best yet!! I made a few minor changes d/t diet restrictions such as substituting 1c of skim milk & 1/2c Chobani yogurt in place of cream (which curdled a bit at first but after simmering awhile, curdling was gone) and placed 15 almonds and 15 cashews in the milk to soak an hr ahead and then made a nut paste of them. I also only had Fenugreek seeds, on hand, so I pan fried them a little, crushed them, put them in the sauce for approx 15 minutes and then strained them out since the seeds are so bitter but I still wanted a little of their flavor. (I'll use Fenugreek leaves next time 😉 ) Along w/ it I served up brown basmati rice w/ sauteed slithered almonds and green chili/onion Masoor Dal Chiladas. The house has never smelled this good even the next day! Guess what I had for b-fast?! 🙂 Have been playing around w/ several of your pestos and sandwich dishes and they are truly not only the BEST but unique also!! I've also been doing quite a bit of Indian cooking the past few months (primarily curries) served up w/ homeade Chapati's and Dal Chiladas. My husband's favs have been Butter Chicken (Murgh Makhani), Prawns Makhani, Prawns & Lobster (Chingri) Malai and Aloo Mutter. I just followed you on Twitter, I hope to hear if and when you do a Malai curry, as I haven't really found a good one thus far, unfortunately. Love your site and soooooooooooooo many WONDERFUL ideas and all of your SCRUMPTIOUS dishes. Gonna try your Pumpkin Gnocchis in a Creamy Gorgonzola tonight. Thank you Kevin! PDB: This would be good with prawns and I really like the use of the fresh almond and cashew paste! I am going to have to try that Prawn and Lobster Malai! It sounds really good! Enjoy the Pumpkin Gnocchi! I just made this, and it was fantastic! Thank you for this recipe! I just tried making this tonight and it was amazing 🙂 Thank you so much for sharing this! Made it was awseome, added 1tbsp peanut butter and 1tbsp of tahini instead of almond/cashew butter, so awesome. Also used quorn chicken and spiced the chicken instaed of marinating, so yummy.